From its lowly origins in the ‘sandbox of the Holy Roman Empire’ until its dissolution in 1947, Prussia left an indelible mark on the region, the remains of which, on the streets, in the buildings, and the culture, are still visible today. 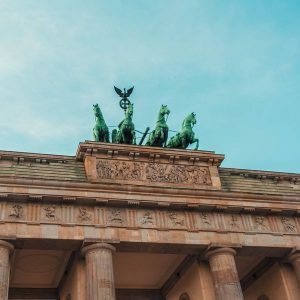 In Berlin, the neo-classical architecture bequeathed to the city by the former Hohenzollern ruling family stands as a fitting monument to a nation that sought to establish itself on the world stage, eventually rising to become the motor behind German unification in 1871. The reign of Frederick II (Frederick the Great) in the 18th century has come to epitomise the spirit of Prussia. The king who saw himself as an enlightened absolutist monarch, embracing the arts, sciences and humanities, promoting enlightenment values, whilst nursing a military capacity that would become both feared and respected throughout the world. At its peak, the territory of Imperial Prussian stretched from the Rhine in the West to the Vistula in the East, with Berlin as the seat of the royal family and capital of the ‘Iron Kingdom’.